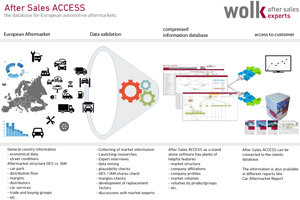 We present the premiere of After Sales ACCESS - the unique database with a complete compilation of all important information about the European automotive aftermarket. For the first time, you will find our carefully researched information that is available in the form of the "Car Aftermarket Report" now as a digital application with much more detailed information and functions. On clear and well-organized views you will keep the structures of the European markets at a glance and you are able to query detailed company profiles and the linkages of the market participants. All information you find with a few clicks and can be easily exported to Excel. After Sales ACCESS is available as standalone software as well as integration via interface into existing CRM/ERP systems. Arrange an appointment with us for a demonstration of our After Sales ACCESS Database. 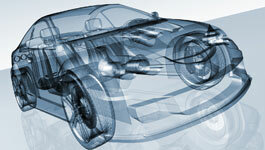 This report gives a comprehensive overview of the largest and most important car parts distributors in the independent car aftermarket in Europe and contains a total of approx. 250 company profiles in 35 European countries. 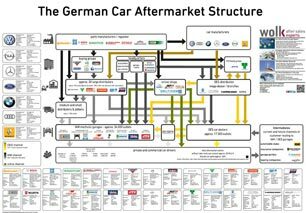 This poster presents the German car aftermarket with all its market participants and their distribution channels with each other clearly at a glance.